Last month, AUT doctoral student Ankita Poudyal took out first prize at the Falling Walls NZ competition! Falling Walls is all about celebrating and communicating research that ‘breaks down walls’ – inspired by the fall of the Berlin Wall in Germany. Ankita’s win is a massive achievement, especially since the competition is open to emerging researchers from all over the country, both within and outside of academia. Ankita gave a 3-minute talk about her research into nano-coatings for air filters. Her work is contributing to filters that can remove particulates from the air without clogging or compromising air flow, potentially allowing us all to breathe easier in the future. 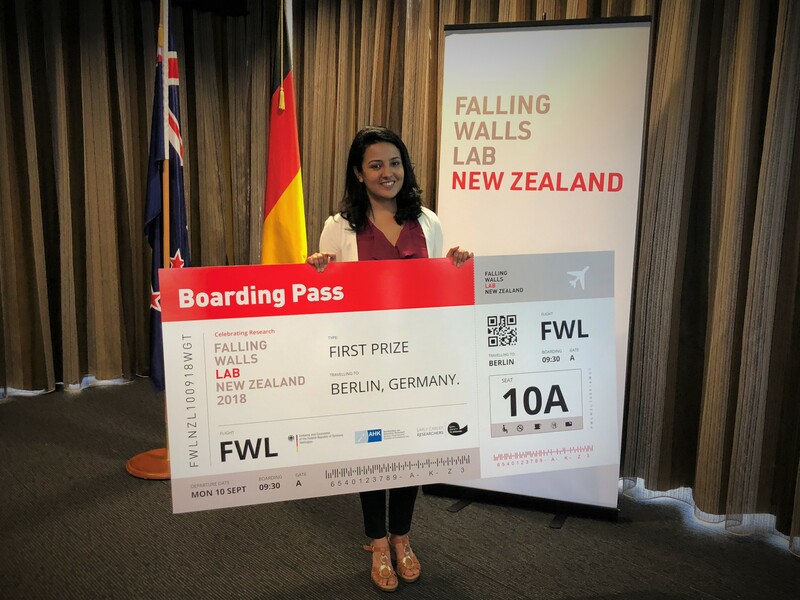 Following her big win at the New Zealand competition, Ankita will travel to the Falling Walls conference in Berlin to compete on the world stage. We asked her a few questions about her experiences. Thesislink: What does it mean to you to ‘break down walls’ in your research? Ankita: Breaking down walls signifies overcoming problems and difficulties. Similarly, my research is working towards finding a potential solution to make efficient filters that can overcome the problems of conventional filters. Most commercial filters that claim high removal of particles are made thick and compact. As a trade-off, they block the airflow. On the other hand, if filters are made thinner, they fail to capture particles. There is always a compromise between the two aspects. I hope that through my research I will be able to solve this problem and break that wall of inefficient filters. Thesislink: What were your techniques for developing and practising your presentation? Ankita: I wrote down multiple drafts until I was finally happy with one. I read my drafts to everyone around me – my supervisor, my colleagues and my family members – and asked for their suggestions. In addition, I took part in the AUT 3MT competition that significantly brushed up my presentation skills and boosted my confidence. Thesislink: How did you frame your research to ensure that its significance was clear to non-specialists? Ankita: Such presentations are challenging because the participants come from diverse areas. The same is with the audience and the jury. On the positive side, it makes the experience very interesting and enriching. I tried my best to avoid technical terms and explained along with analogies that can be understood by everyone. Similarly, I kept my slides very simple with fewer words and less animations. Thesislink: What was it like competing against professional researchers as well as postgrads? Ankita: It will be one of the most memorable experiences as a PhD student because although I am just in the beginning phase of my research journey, I got an opportunity to stand and present along with many other professional researchers who had already achieved so much in their respective areas. It was refreshing to come out of the bubble and learn about different projects in other areas. Thesislink: Do you experience stage fright? If so, what are your tips for overcoming it? Ankita: I do have stage fright but the good thing about short presentations is that you can rehearse many times before you present. Once you know what you are exactly going to speak, you will be more confident. I made sure I did not rush through my presentation and took pauses so that I could breathe and relieve my nerves even while I was speaking. Thesislink: How did you present yourself on stage? Ankita: I got only 3 minutes to convey my research so it was very important that I sounded passionate, well informed and very positive about my research and results throughout my presentation. At the same time, I tried to avoid the monotone in my voice and excessive movement of hands. Thesislink: What kinds of emotions did you experience throughout the competition and upon your win? Ankita: I was already feeling glad that I was selected to present amongst such experienced researchers. Therefore, winning it was definitely an amazing experience. There were some great ideas that were pitched so well and honestly, I was not expecting to be the winner. Looking back, I feel very happy that I took that chance. Thesislink: What do you plan to do to prepare for the international finals in Berlin? Ankita: The main framework for my presentation will probably remain the same. I have tried to improvise it a little bit more with suggestions from my supervisor. I am looking forward to give my best in the finale and more than that, I am excited to meet 100 other finalists from 100 nations. Ankita Poudyal will represent New Zealand at the final of the Falling Walls competition in Berlin on 9 November. Good luck Ankita – we will cheer you on from here!